Samsung heir Lee Jae-Yong was back in court Thursday to appeal his five-year sentence for bribing South Korea's ousted president Park Geun-Hye, with prosecutors arguing for a longer jail term. Lee, vice-chairman of Samsung Electronics, was found guilty in August of bribery, perjury and other charges relating to payments made by Samsung to Park's secret confidante Choi Soon-Sil, but the 49-year-old's lawyers argue he is innocent. "The evidence-only principle was pushed aside," lead counsel, lawyer Lee In-Jae, said at the appeal trial at the Seoul High Court. 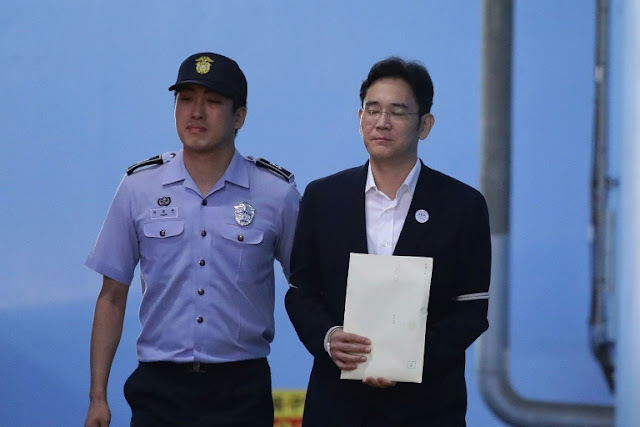 The original verdict found that a total of 8.9 billion won ($7.9 million) was paid in return for favours including government support for Lee's succession at Samsung after his father was left bedridden by a heart attack in 2014. Wearing a dark suit and white shirt with no tie, Lee looked gloomy in the courtroom as his lawyers argued that the payments were not bribes but donations to support athletes -- which happened to include Choi's equestrian daughter. Lawyer Lee In-Jae said there was no material evidence to back charges that Lee asked for policy favours when he met Park in 2014. Four other Samsung executives convicted on the same charges and given sentences ranging from four years to suspended terms were present at the appeal hearing. Prosecutors are also appealing part of the original verdict, which found Lee innocent of some of the bribery charges, and are calling for harsher sentences for all the five. The lower court should have included as bribes another 20.4 billion won that Samsung funnelled into two dubious foundations controlled by Choi, prosecutors claim. The lower court said Park was aware that Lee wanted state approval for a controversial merger of two Samsung units in 2015, seen as a key step to ensuring his accession. The deal was opposed by shareholders who said it wilfully undervalued shares of one of the firms. But it eventually went through after the National Pension Fund -- a major Samsung shareholder -- approved it. A prosecutor said the five-year jail sentence was "too light" when taking into account the damage inflicted upon millions of subscribers to the National Pension Fund. "The operations for Lee's succession were maximizing Lee's gains by sacrificing... shareholders' and pensioners' interest", Prosecutor Park Ju-Seong said. A verdict on the appeal is expected by February 2018. Park, the first female president in South Korea, was impeached and arrested in March and indicted in April on a total of 18 charges including corruption and power abuse. She is being held in solitary confinement. The lower court's verdict on Park is likely to come next month. 0 Response to "Appeal trial for Samsung heir starts in Seoul"